Shop for authentic Kansas Flags. 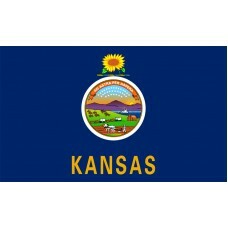 We offer indoor and outdoor Kansas flags in durable nylon. Our outdoor flags are finished with a canvas heading, while indoor flags are finished with a lined pole hem and your choice of with or without fringe. 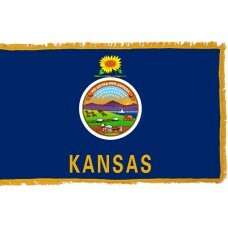 We also offer indoor and outdoor Kansas flag sets. The Kansas State Flag features is a dark blue filed with the seal of Kansas in the center. Above the seal of Kansas is a sunflower on a twisted blue and gold bar and below the seal the word "KANSAS" is written. The seal is a depiction of Kansas's history and features a landscape with a rising sun, liner and steamboat, settler's cabin, and a man with horses plowing a field, a wagon train, Indians hunting an American bison, and a group of 34 stars with a band above them with the state motto "Ad Astra Per Aspera" which translates as "To the Stars Through Difficulties." The rising sun on the seal represents the East, the river and steamboat represent the commerce, the cabin, settler, and plow horses represent the agriculture, the wagon train which is heading towards the West represents the American expansion, the Indians hunting the bison represent the culture of Kansas, the state motto represents the high aspirations that the Kansas people hold, the 34 stars represent Kansas as the 34th state to join the United States of America, the sunflower is Kansas's state flower, and the twisted blue and gold bar below the sunflower represents the Louisiana purchase. The Kansas State Flag was designed by Hazel Avery and was adopted on September 24th, 1961. Kansas is a state located in the Midwestern region of the United States of America. It shares borders with Nebraska, Missouri, Oklahoma, and Colorado. The name Kansas is derived from the Kansa American Tribe which translates as "People of the south wind" and is divided in 105 counties with 628 cities. The capital city of Kansas is called Topeka and the largest city is called Wichita. Kansas is also referred to as "The Sunflower State" as sunflowers grow in abundance here, it is the state flower and also represented on the flag. It is also known as "The Wheat State," "The Breadbasket of the world" and "The Jayhawkers State." It was referred to as "The Jayhawkers State" due to Irishman Pat Devlin. When he was asked why he was collaborating in the raids and conflicts between Kansas and Missouri in 1856, his response was: "You know, in Ireland we have a bird we call the Jayhawk. Which makes its living off other birds. I guess you might be saying I've been jaywalking." Kansas was originally inhabited by Native American Tribes. The first European that arrived in the area was Spanish Conqueror, Francisco Vazquez de Coronado in 1541. In 1803, the majority of Kansas was controlled by the United States of America following the Louisiana Purchase except for Southwest Kansas which still belonged to Spain, Mexico, and the Republic of Texas until 1848, when the lands were given to the United States of America. Kansas became the official 34th state of the United States of America on January 29th, 1861.